Are you using these 3 amazing Google Sheet features ? Dictate a document instead of typing it! Click the More actions button and select Sharing and Permissions. Next to "Use same permissions as the Site," click Change. In the dialog box that appears, under the "Use custom permissions" section, select Add new users to this page or Do not add new users to this page. While on your permissions page for your Private Page, delete your interns from your page. Finally, set everyone who isn't an accountant or an intern to Can view. In order for a person to be able to view or edit a specific page, you'll first need to add that person at the site level. You can then change which pages they can view or edit. In your site hierarchy on the left side of the "Sharing and Permissions" page, click on the page that you want to set permissions for. By default, your page will be set to use the same permissions as your site. To have this page use different permissions, click Change next to "Use same permissions as the Site." Under "Use custom permissions," choose if you would like for this page to be visible to people you add to your site or if this page will only show to new people if you also specifically give them permission. You can always change how this page updates permissions later. Once you've made your selection, click Save. You'll now be able to set each person's access level for that page. Or, if you don't want a person to be able to see the page at all, you can click the icon on the right side of their name. This will also prevent them from seeing any pages below this page. Click Save changes to save your page-level permissions. You can now see what permissions people have on this page in the box on the right side of the "Sharing and Permissions" page. You can also see the permissions for other pages by clicking on those pages in your site's hierarchy on the left side of the "Sharing and Permissions" page. * Google Vault is available with G Suite Basic as a paid add-on. * G Suite Business accounts with 4 or fewer users get 1 TB per user. ** Any purchased accounts at ceoitbox.com will get support from us. * By default the legacy free edition of Google Apps only supports domain aliases, not secondary domains. However, at ggappsfree.com we can adding secondary domains and making your domain as primary. * Some Mobile Device Management features (like Device Owner) are not available in G Suite for Education and can be purchased. Please select the correct domain names that you wish to configure as Primary & Secondary domains for your G-Suite account. This will work fine if there is no website hosted by you or website is hosted on the same host. So you need to provide us the credentials of the Domain Provider. In case you have hosted a website using a different company then you will need to make the changes on the domain panel of the company where the website is hosted. In this case you need to provide credentials of the Website Hosting provider's Cpanel. c. Add the TXT records to DNS for additional security settings like SPF, DKIM etc. If your Google sheets are taking forever to load or process data, then these 20 Optimisation strategies will be able to help you. Calculations become very slow and loading bar appears frequently every time you make a change in the sheet. 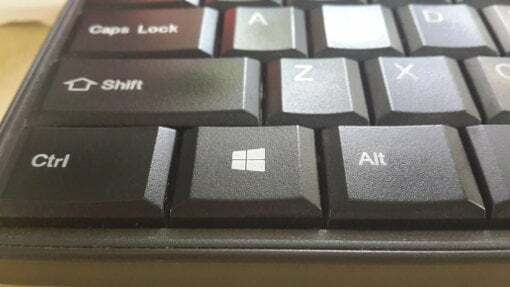 Sheets are slow to respond to mouse or keyboard clicks. Data does not show even after you have entered the same into a cell. You need to reload the sheet sometimes to have it show. Sheet becomes un-responsive. You may get an error message like the one below or you may need to re-load the page. Computer heating up, using a lot of RAM & battery. 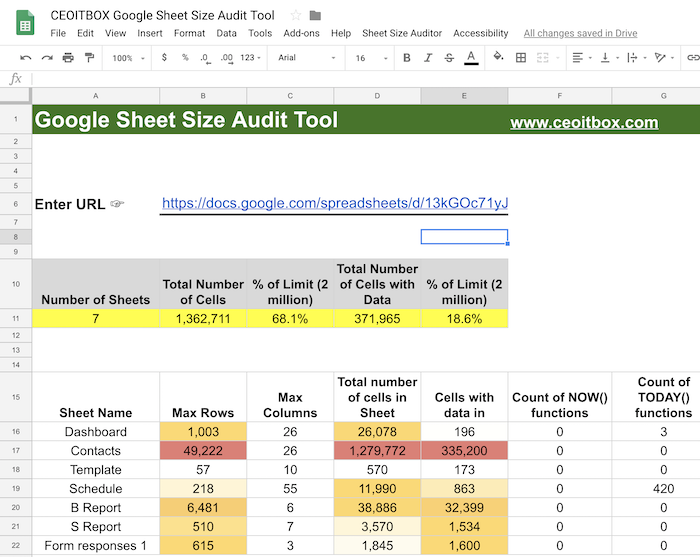 Google Sheets has a limit of 2 million cells per workbook (see Details Here). Google Sheets has a maximum number of columns of 18,278 columns. Within a single cell, there’s a maximum string length of 50,000 characters. You can add a maximum of 40,000 new rows at a time. Using a special audit tool you can see the total number of cells in the Sheet, how many have data in them and then statistics for each individual sheet too, including how many volatile and array functions you have. Google Sheets get slower as they get larger. So one of the first things to try, is to reduce the size of your Google Sheet. Blank rows\columns slow down performance, dramatically so in fact. So it’s a good idea to delete them whenever you can, so you reduce the number of cells Google Sheets is holding in memory. Ideally you should remove any large numbers of blank rows under your data, or columns to the right of your data. Especially for pages getting input from Forms you can delete all the rows under the data as every Form Input creates a new row for itself. After you have used a set of formulas in your data, you don't need them again, you should convert them to values. This is also true for columns like S.no etc. This will reduce the file size, which will help performance overall, and it’s also best practice (to reduce errors occurring if someone or something happens to break the formulas). extra calculation overhead to your Sheet. 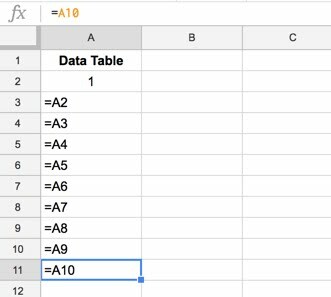 It might not look like there’s much data in column A, but Sheets will check every cell, including all the blank ones, if you use open ranges like A:B. Remove volatile functions or use with caution - NOW(), TODAY(), RAND() and RANDBETWEEN() as they recalculate every time there’s a change to the Sheet. All dependent formulas must also be recalculated too (i.e. formulas that reference or include a nested volatile function). This uses up processing power and so can negatively impact your Sheet’s performance. Best idea is to put these functions in a cell like A1 & then you can refer to the cell in any formula using $A$1 (absolute reference) where required. This will significantly increase the speed. Use closed, rather than open, range references for your search tables where possible. Reduce the size of your lookup table, if possible. For example, rather than search across everything you might use the Filter function to create a smaller, helper table for the lookup first, and then use that in your VLOOKUP. Don’t nest the FILTER (or other) function inside your VLOOKUP and create the table on the fly each. It’s much, much slower. The ImportHtml, ImportFeed, ImportData, ImportXml and ImportRange formulas pull data from sources external to your Google Sheet, so they require an Internet connection to function and are slower than other functions that operate entirely within your single Sheet, so they will potentially affect the performance of your Sheet. The best idea is to minimize the number of times importrange formula is used. It may be best to get the entire data in one go in a hidden sheet and then use the data for reference in other sheets instead of having multiple use of import range. The same can be done for any formula. Other examples could be to check if a certain Value is larger or smaller or check for a certain text to do length calculation only if required. You can actually turn Calculation on & off using a control switch cell with the IF statement. This way the sheets will not slow down as they will only start calculating the desired formula when you actually need them to. For example - Use data validation to create a drop-down menu in a single cell, the control cell, with values “Process” and “On Hold”. The Filter, Unique and Array_Constrain functions can be used to create smaller helper tables for further data analysis work. If you had a big table with 150,000 rows of data in, but were only interested in performing calculations on a smaller subset meeting certain parameters like "New/Old", "Country/City etc." , then you could use these functions to reduce the size of your table and create a new helper table for your calculations. It's better to reference a single cell with absolute references and then copy that down your column, e.g. Conditional formatting can be very slow on large datasets because it’s implemented on a cell-by-cell basis. So it’s best to use it for small data tables and in your dashboard reports. You will see immediate improvement by removing the same from large data sets. Assuming we’re sticking with Google Sheets though, it might be time to split up your huge dataset into separate Sheets if your Sheet is so slow that it’s frustrating to use. This is especially true if you are importing large amounts of data from other sheets. If you are importing data from say 16 separate files then instead to importing directly into one single file it may be an excellent idea to make 3 or 4 separate sheets and each one imports data from 3-4 sources. You can them bring the data from just 3-4 sources to your main sheet. This will reduce the calculation load on the main sheet and make things much faster. Once your sheet starts getting too much data and is becoming sluggish it may be a good idea to Archive the old data into a separate sheet for future reference. Maintain the past Months, Quarter or Year's data as your need may be. Once you’ve completed all the steps for all your archived data, you’ll want to remove it from your master Sheet. I’d advocate keeping a full copy of your master Sheet before you start deleting any rows of data though. You’ll end up with a master Sheet that just has your current, or live, data in it, and it’ll hopefully be much faster. You can also do any calculations or data analysis locally and then bring the data back together in your master Sheet using the IMPORTRANGE formula. Google Apps Script can be used to extend the functionality of Sheets. Apps Script is extremely effective at doing big batches of calculations, especially repetitive ones, often more quickly than thousands of regular formulas. Detailed instructions on the same are out of scope of this article, however we do conduct in-dept tutorials for the same. You can send you inquiry using this LINK to us for training on Google Apps Scripts. Close and re-open the Google Sheet (sometimes it’s the simplest fixes that work). Refresh your browser. Close other tabs, opening too many tabs will slow down your computer as each Tab uses a large amount of RAM. Try another browser or operating system. Make sure both browser and operating system are currently running on their latest version. Disable browser plugins or extensions or try accessing the sheet in Incognito\Private mode. Try replicating the issue on another computer to see if it’s the computer hardware having issues. A Google Sheet’s calculation speed depends mostly on the local resources. Try replicating your issue on another network to see if it is a network/internet issue. Most functions are run locally in the browser but some, like the IMPORT formulas, require access to the Internet (as well as any Apps Script which is run on Google servers). Try disabling and re-enabling offline access. Try on a different or a faster computer. There will come a time, when Google Sheets won’t fulfill all of your data needs. There is the 2 million cell limit that may fill up pretty quickly with real-world data. Before you hit the 2 million limit you should think through the next steps beyond slow Google Sheets. You’re going to want to move your data into a database archive. You can still work in a Sheets environment but offload the data storage to a dedicated database. Within the Google ecosystem, we’re talking about BigQuery and Cloud SQL, both cloud databases. However, the integration isn’t simply drag-and-drop anymore, so you’ll need development skills to connect these services. Google BigQuery is integrated with Google Drive, so you can use your Google Sheets as tables in BigQuery. You can also use the BigQuery Apps Script service to manage your BigQuery projects. Connecting a Google Sheet to Cloud SQL directly requires Apps Script, although you could export data from Google Sheets (e.g. as CSV) and import that into Google Cloud SQL. Detailed instructions on the same are out of scope of this article, however you can send your inquiry using this LINK to us for more details & support on this Topic. I hope that you will find a lot of value in the above article. Google Sheets are only a small part of the Tech Ecosystem that can help you to convert technological threats into an opportunity, re-invent themselves & transform their industry. If still find yourself struggling even after doing lengthy & expensive trainings then probably you lack the Thought Process & Tools for Exponential Growth. STOP trying to Re-Invent the Wheel ! Check out our 100% Practical & Transformational Coaching that have turned around hundreds of businesses. Remember: You need to work Hard in Business but Struggle is optional ! Learn how to resolve the Message Blocked issue affecting new G-Suite users when trying to send an email through Google Apps Script. Please see the video below where I have explained the issue and how to resolve the same in detail. For any further support please contact me at siddharth@ceoitbox.com. Do feel free to browse this site for more amazing Tips & Article on how to use Technology to Grow your business. We also conduct unique Tech Workshops to help you Grow your business ! Gmail.com gets its biggest upgrade in the service's history. There's a new Confidential Mode, the ability to set expiration dates and passcodes for emails, and other advanced security features. If you’re using a G-Suite Legacy\Paid Account, your account administrator will have to turn on the new interface for you. We hope you find this interesting and valuable. 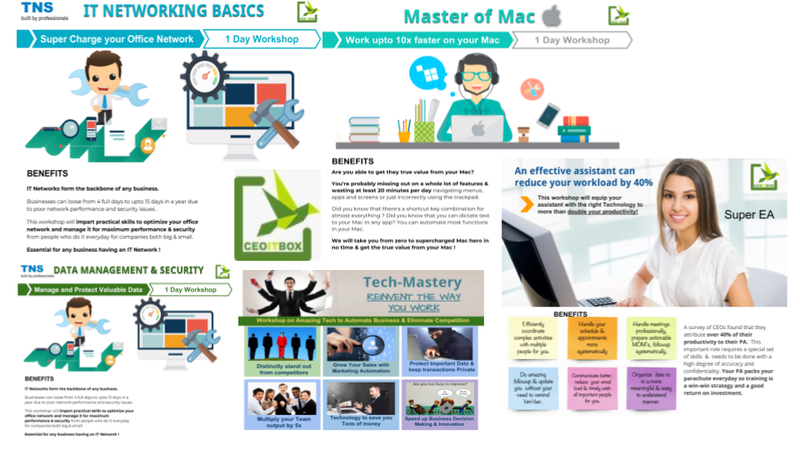 We also conduct unique Tech Workshop to help you build Remarkable Intranets ! This is a video guide, please see the video below. It is not uncommon to have several email accounts, but checking multiple accounts in different places is tedious. Hence, many people revert to a desktop email client like Thunderbird or Outlook to manage all their mail from one place. However, I found that Gmail can do the same and it can do it much better. Since I switched, I no longer have to worry about backing up or moving my profile, I save a bit of RAM as my browser is running anyway, I save several gigabytes of hard drive space, and no matter where I check my mail, it’s always the same familiar inbox and setup greeting me. The video below illustrates how to do this easily. If you are using the paid G-Suite account and get the following error you may need to enable this functionality from your Administrator Console. How do I allow or disallow users to use an outbound gateway? By default, users cannot use an outbound gateway; the G Suite mail servers deliver all outgoing mail, including mail that uses alternate From addresses. From the dashboard, click Apps, then click G Suite > Gmail > User settings. In the Allow per-user outbound gateways section, select Allow users to send mail through an external SMTP server when configuring a "from" address hosted outside your email domains. When this check box is selected, users who associate additional email addresses with their accounts have the option to enter connection information for an alternate SMTP server. (Learn more about the required steps for the user.) When the check box is not selected, users cannot specify an SMTP server for the additional address. It can take up to an hour for the changes to propagate through Google systems. 1. 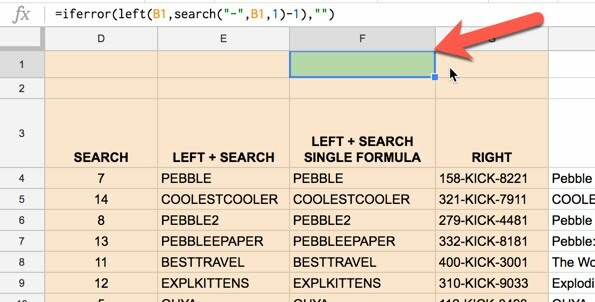 Protect your Google Spreadsheet data from accidental or malicious changes with these 3 methods. The ability to share and collaborate on a spreadsheet in Google Apps is an excellent feature, but it may mean you need to look more carefully at protecting your data from unwanted edits. There are 3 key ways to do this. Protect individual worksheets in a Google Spreadsheet. To do this, select Tools from the menu and choose Protect sheet. You have the option to set permissions, much like a Google Doc, that will give editing rights to: anyone invited as a collaborator; only you; or a list of collaborators. If you need to stop collaborators from editing certain cells, you could place those cells in a "Results" worksheet and make that read-only. Formulas can reference any worksheet so cells that need data entry can be "opened up" and cells that have a formula can be "locked" in a protected worksheet. Get notified of any changes in a Google Spreadsheet by setting up notification rules. To do this, select Tools from the menu and choose Notification rules. You have the option to be notified when changes are made to: the spreadsheet; a specific worksheet; a cell or cell range; collaborators; or (if the spreadsheet is joined to a form) when a user submits a form. Notifications can be sent as soon as a change is made or as a daily summary. The first 2 options are straightforward changes that offer good options to protect most spreadsheets, by stopping editing and notifying you if changes are made. But what if you need to protect a series of cells or an individual cell? Google Spreadsheets currently doesn't have this functionality, so a workaround is required. Stop individual cells, or a range of cells, from being edited by setting a value that the cell must have. Choose to set a Number, Text, Date or Items from a List. Each criteria has further settings, for example: a Number cell can be a range or maximum value; a Text cell can be set to contain or not contain word(s); a Date cell can be set to be a valid date only; and a List cell can only be populated from a list. A further option enables you to either warn the editor that validation rules have not been met but allow the change, or disallow any changes that do not meet the criteria. select the Text criteria and set the second drop down to "equals"
untick the Allow invalid data box. The SPARKLINE function allows you to create miniature charts within a single cell to rapidly provide an attractive visual representation of data and trends. Google recently added the two new types - column and winloss - along with the existing line graph and bar chart. Our example shows a sheet with some data (source Wikipedia) on human population by country and represents the trend in population growth/decline over the years 1990, 2008, 2025. We show 3 types of SPARKLINE charts: line, bar & column. Here’s a link to a copy of our example sheet. Click on “Make a copy” option to take a copy for yourself to have play with. Google’s constant innovation continually provides Apps users with new ways to use and gain benefits from files and data. The Sheets Explore function generates charts enabling insight and analysis on data for Sheets users who have little knowledge or confidence in using charts or just saving you some time making your own. To access Explore, open a spreadsheet. To work on a specific portion of your data you can select a range of cells. By default, Explore works on where your cursor is in the current worksheet. In the bottom right, look for the Explore icon . When the icon is green you can click it to see recommendations and tips. When the icon is grey, there is no analysis to see. Charts and analysis will pop-up, showing trends and patterns in the data in your worksheet. Hover over a chart to see which data in the spreadsheet is being used in that chart. You can change the recommendations by selecting different areas of data in your worksheet. To add a chart or formula from the Explore panel into your worksheet you can it onto your spreadsheet. Alternatively by clicking the Insert chart icon . Note: You must have edit permission on the file to be able to add a chart or formula to a spreadsheet. Use the This Example Spreadsheet (Click Here) and have a play! Hope you liked the above article. 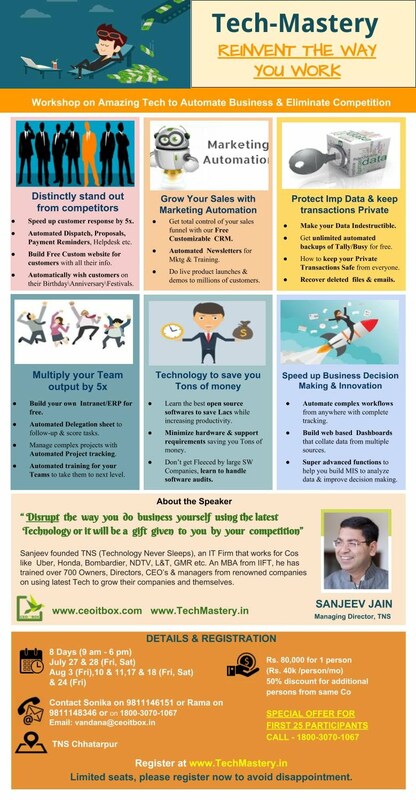 We do some amazing & unique workshops that can help you Scale up & Automate business.